We’re excited to announce that Curalate has joined Tumblr’s official A-List partner program, becoming Tumblr’s only visual analytics partner. With this partnership, Curalate has access to Tumblr’s firehose and the 130 million images that are shared daily across the network. And why is this so important? 75% of posts on Tumblr are images with no associated text or hashtags, making them completely invisible to other analytics tools. By applying our image matching technology to Tumblr, we’re able to discover and track your brand’s images across the entire platform–no hashtag, keyword tracking, or referral URLs necessary. We’re making the invisible visible. 1. Measure the performance of any and all images belonging to your brand. With access to Tumblr’s firehose, in addition to tracking your brand-page activity, Curalate monitors users’ Tumblr posts that include your brand’s products and images, regardless if your brand’s name is mentioned.As a result, you’ll be much smarter about the specific content engaging your fanbase. Use these social cues to drive business-wide efforts, like email marketing and ecommerce optimization. Use Case: Share the most popular Tumblr images from the previous week with your email marketing team to arm them with content that’s already been proven. Compare the click-through rate of this email with previous campaigns to track effectiveness. 2. Determine which content and products matter most now. Filter between “Trending” and “Popular” in the Tumblr summary screen and reveal what’s currently “hot” as opposed to what’s been historically popular. Why is this important? Well, just like we’ve seen with Pinterest, content that gets popular on Tumblr tends to stay popular. Use Case: Each week, create a “Top Picks from Tumblr” post and feature content and products that are labeled as Trending within Curalate. 3. Understand how a given image travels across social. 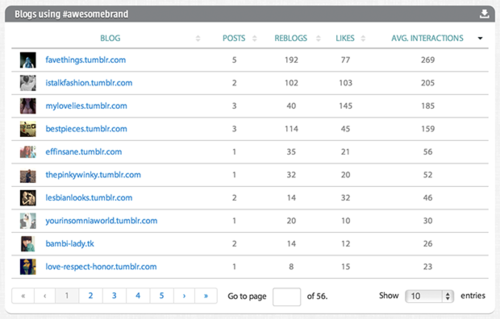 Access Tumblr data in the cross-platform view for a holistic view and see how engagement on Tumblr compares to Instagram, Pinterest, and Facebook. Use Case: Hover over one of your top performing Tumblr images to identify if that image has been shared cross-network. If not, use our universal share feature to send your content to Twitter or Pinterest and share content that’s already been proven. 4. 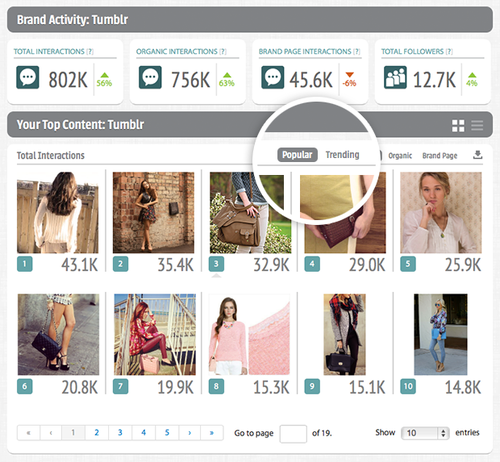 Engage with your brand’s Tumblr influencers and advocates. There are specific Tumblr users that are sharing your content on a regular basis and driving impressions, clicks, and community. Easily identify who these users are to build relationships and leverage them for influencer/advocate campaigns. Use Case: Launching a new product? Curalate can help you identify the users that are driving the most reblogs of your content and offer them exclusive content to share to their Tumblr blog(s). This could be product photography, behind the scenes footage, or even the actual product. 5. Not on Tumblr yet? Not a problem. On image-driven platforms like Pinterest and Instagram, your fans are driving the conversation. This is no different for Tumblr. 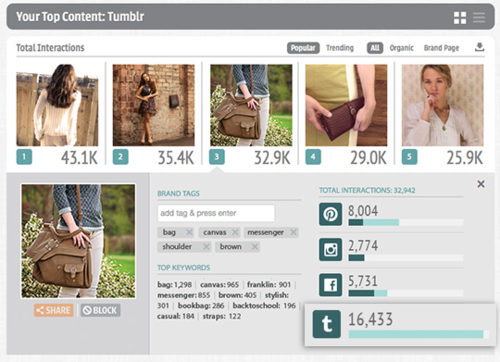 As a result, consumers are spreading your brand’s content across Tumblr regardless if you have an official brand page. 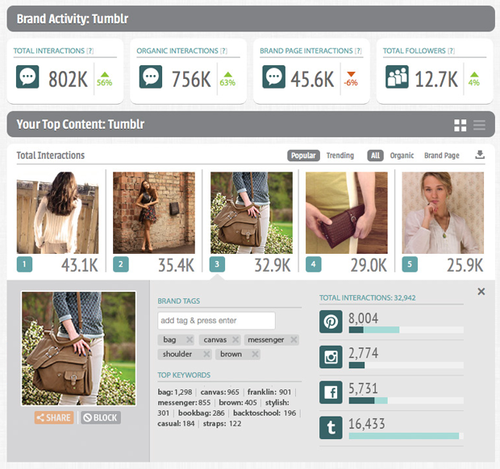 Leveraging Curalate’s Tumblr integration, you can finally understand and tap into visual engagement with your content. As a result, brands that aren’t even on Tumblr yet, like Lilly Pulitzer, are using Curalate’s Tumblr insights to make smarter marketing decisions and plan to make the image-driven platform a larger part of their digital marketing strategy in 2014. Contact Support@Curalate.com now to enable Tumblr within your dashboard or visit the Curalate Knowledge Base for more detailed information on this new integration.